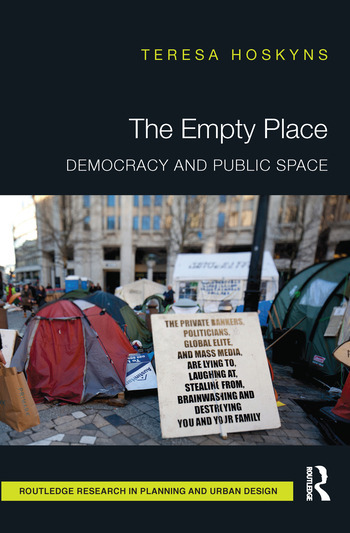 In The Empty Place: Democracy and Public Space Teresa Hoskyns explores the relationship of public space to democracy by relating different theories of democracy in political philosophy to spatial theory and spatial and political practice. Establishing the theoretical basis for the study of public space, Hoskyns examines the rise of representative democracy and investigates contemporary theories for the future of democracy, focusing on the Chantal Mouffe's agonistic model and the civil society model of Jürgen Habermas. She argues that these models of participatory democracy can co-exist and are necessarily spatial. The book then provides diverse perspectives on how the role of physical public space is articulated through three modes of participatory spatial practice. The first focuses on issues of participation in architectural practice through a set of projects exploring the ‘open spaces’ of a postwar housing estate in Euston. The second examines the role of space in the construction of democratic identity through a feminist architecture/art collective, producing space through writing, performance and events. The third explores participatory political democratic practice through social forums at global, European and city levels. Hoskyns concludes that participatory democracy requires a conception of public space as the empty place, allowing different models and practices of democracy to co-exist. Teresa Hoskyns is an architect and lecturer at the University of Sheffield, UK.